As recently posted in my blog, I've been expecting a pull back. However the market has made a fool of me lately. The S&P 500 passed through the 1010 mark today on rather bad news, so maybe this rally is for real and will continue. However, I'm still cautious about purchasing stocks (unless I write a call option against it immediately), but for the calls written today and those which I'll write on strength Friday are certainly for higher strike prices (a more bullish approach). The majority of the strike prices indicated in this post are for the next higher strike option. With only 1 week until expiration I have outlined some "weekend write ideas", which is for selling the call against the stock for the August options expiration. To learn more about this strategy, and stock options in general click here. I will use the 25 largest stocks (by market cap) in the S&P 500 for my analysis, I will then write about 10 higher beta stocks which are much more volatile and you'll be able to compare premiums. To understand the table, I will give a detailed example of Google (GOOG) below. Sell the Google August 470 strike call option. The return if the stock is assigned at expiration is 2.25%, and if the stock is not assigned the return from writing this is 0.58% (or lowers the position by 0.58%). Based on the current options market, the contract will lose $56.80 (a gain of 25.2% on the premium) over the weekend as the stock sits inactive. All data as of market close Thursday August 13, 2009. As promised below is a list of 10 higher beta stocks. As you can see the more volatile the underlying stock, the greater the: return %, protection %, and loss the contract loses over the weekend. To better understand options in general, including this strategy, these percentage calculations, and other option strategies click here. As an owner of Bank of America, Citigroup, Goldman Sachs, Ivanhoe Mines, Las Vegas Sands, and Palm shares, I've written and traded many of these option ideas for the August options expiration. I will look to write out some more shares of Bank of America Friday on strength, especially after that huge day Thursday. These 6 stocks listed above are more volatile than many of the stocks listed in this article, and although they are more risky, they are much better for this strategy. To reiterate a previous blog post: As the Volatility index is creeping back up, call option premiums should increase in value overall, protecting and giving an even higher return. I use this strategy to write my shares out on strength, and purchase them back on weakness (if I am profitable). For example: using this strategy has allowed me to cost average my position on Caterpillar down to $4.88 a share. Patience is the key to succeed with this strategy. If the stock gets called out, and you miss some of the upside, you can always use the buy/write option strategy to get the stock back for the following month. With the VIX at historic highs and call premiums exploding, selling deep in the money covered calls on my shares from September to December allowed me to trump the market, and actually make a profit. All of these options expire on August 22; therefore the last trading day is Friday, August 21, 2009. Keep in mind when using this strategy it is essential that broker commissions are low enough to profit from the position. Trade as many contracts as you can for a flat fee of $9.95 here. Yes it's true and no catch, I've traded 100 contracts at a time for a flat fee of $9.95! As I recently wrote on OptionMaestro.com, I believe the bank stocks are especially overpriced, but don't really want to sell all of my shares (as this stock market could continue rallying). In this post there are two types of hedging or protective ideas that require the use and knowledge of stock options. To learn more about the risks, pricing, calculations, strategies, and options in general click here. My major reason for taking a protective stance on the financial stocks is because they have risen the most since the March 2009 stock market bottom (they also fell the furthest in the market massacre - which is one of the reasons I'm taking these option approaches versus selling all of my shares). The Google Finance chart below shows some of the very popular SPDR ETF's and their performance since March 6, 2009 (click image to enlarge). 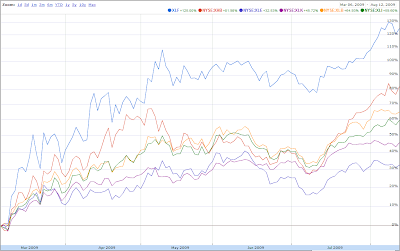 As you can see the Financial Select Sector SPDR has outperformed the other 5 in the same chart by at least 50%. As I've stated in several blog posts, I believe if we get some sort of market correction the financial stocks [sector] will suffer the most, simply because they are overbought compared to the other sectors. As stated in Sell Off Ahead? 25 Ways to Profit and Protect from a Stock Market Correction, I still believe we may see a pull back on the major indices within the next month. Strategy #1: Using Put Options Open a vertical Put Spread. This will allow you purchase put options for cheaper, but also limits the downside protection on the stock. I chose the October, November and December options expiration (depending on the underlying stock's option cycle), which will provide 65, 100, and 128 days of protection respectively. Many people try to use the Leveraged Index ETF's such as SDS and BGZ as a means of protection, but increased swings (volatility) will cause these vehicles to decay (see more here). Opening this strategy on these stocks isn't free, but I believe it is a better way to hedge than purchasing leveraged ETF's. All data as of market close Wednesday August 12, 2009. Month: This is the month both option contracts expire; O = October, N = November, and D= December. U Strike: This is the upper strike or the put contract which is being purchased. L Strike: This is the lower strike or the put contract being sold against the put contract which was purchased. Protect: This is the amount of protection the position provides once the share price falls to the upper strike price (in %). Net Cost: This is the amount that must be paid in dollars per share to open this position. Saved: This calculation shows how much less the position will cost by making it a vertical spread versus a traditional put position (in %). If the market continues to rally and the puts expire worthless, the premium [cost] paid for the option contract will be completely lost. Most of the option spreads are not yet in the money, meaning the stock can pull back without the position being hedged. If however the market sells off and the stock falls below the higher strike price, the position will be protected until the lower strike price (% protection). Strategy #2: Sell calls against the stock. This will allow the shareholder to receive a premium instead of paying it like the example above. The table below is for ext highest strike call option for the September options expiration. This strategy allows the position to return additional profit as well as providing protection. A worded example follows for interpreting the table directly below it. For return % purposes, the example assumes the stock was purchased and written as of market close Wednesday August 12, 2009. Purchase American Express (AXP) stock, and sell the September 32 strike call option. The premium received from the call option would give a downside protection of 5.97%. If the stock is assigned at options expiration on September 19, 2009 the total return from this position would be 6.60%. As you may have noticed, the less volatile the underlying stock, the less the option premium is (return and protection percentages). Based on this analysis of 10 stocks, the stocks which offer the greatest combination of both potential return and protection are: Citigroup Inc. (C), Regions Financial (RF), and Capital One (COF). As a shareholder of American Express, Bank of America, and Goldman Sachs, I will be using this strategy to write my shares out. However I am a very active trader and will look to write them out for the August options expiration as well. To better understand options in general, including this strategy, these percentage calculations, and other option strategies click here. To reiterate a previous blog post: As the Volatility index is creeping back up, call option premiums should increase in value overall, protecting and giving an even higher return. I use this strategy to write my shares out on strength, and purchase them back on weakness (if I am profitable). For example: using this strategy has allowed me to cost average my position on Caterpillar (CAT) down to $4.88 a share. Patience is key to succeed with this strategy. If the stock gets called out, and you miss the upside, the position is still profitable and you can always use the buy/write option strategy [if you're still bullish] to purchase the stock and generate the income for the following month's option expiration. If the stock gets hammered and you're down on the position, this strategy will keep you in the game and allow you to cost average the shares down month after month. This strategy will give protection if the market sells off, as well as provide a return if the market continues to rally. If the stock is not assigned, this strategy is a great way to create additional income for your portfolio. The reason option volumes have surged in the last 5 years is because they are a great way to hedge your portfolio as well as create income off of your shares (see chart here). Keep in mind when using this strategy it is essential that broker commissions are low enough to profit from the position. All ideas outlined in this article are just examples and are not recommendations to buy or sell any security; if you're more bullish/bearish, you’ll want to adjust the strike price and expiration accordingly. When I was 16 years old, I took a vacation to Italy and purchased a gold chain. At the time I remember everyone telling me the price of Gold was too high, but I'm glad I went ahead and purchased it anyway... It was roughly $400 an ounce. Today gold is trading near $950 an ounce, and I only see it climbing higher. 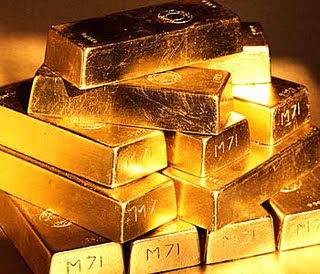 A United States economic recovery or not, I believe gold should increase in value over the next year or two. The U.S. economy recovers, but policy makers don't want to "jump the gun" and increase interest rates right away. Increased fears of inflation are sure to hit the market and speculation drives the price of Gold higher. As can be seen with the price of crude oil and other commodities, gold also starts to rise in value as the U.S. dollar gets weaker. I assume the dollar will continue to get weaker as money is continually printed and pumped into the U.S. economy. Increased levels of uncertainty about the future of the U.S. economy / stock market may influence many to hedge and purchase gold. If these "recovery" talks are shot dead, and the U.S. economy starts to show greater signs of weakness, the speculation and probability of a U.S. credit downgrade should increase. As feared in May 2009, this caused the price of Gold to trade higher. The Google News Timeline below is for the term "United States Credit downgrade", as you can see it shows that there was an increased number of stories hitting the wire for the month of May. The chart below the Timeline is of the SPDR Gold Trust (ETF) (NYSE:GLD), which shows how speculation of a credit downgrade increased the price of Gold (obviously other factors may have increased Gold at the same time, but I remember this being a significant factor in driving up the price of gold) (click images to enlarge). In this post, I will outline three option strategies / ideas to purchase gold. One allows you to create monthly income, and the other two are longer term approaches. To learn more about the risks, pricing, calculations, strategies, and options in general click here. Gold Option Strategy #1: Income generating Diagonal Call Spread Option Strategy. Purchase the SPDR Gold Trust (GLD) March 2010 70 Call option, and sell the August 95 Call Option. The current theoretical option premium for the March 2010 70 call option is 2,340 per option contract. Selling the August 95 call option would lower the cost by 1.5%, and if the GLD is trading at or above 95 per share at August option expiration this position would yield 8.46% (in 10 days). If the GLD does not expire at or above 95 a share, the cost of the position will be reduced by 1.5% and it can be written for a similar strike for the September options expiration, lowering the cost of the position even more. The current September 95 strike call option for the GLD would lower the cost of this position by 5.8% and would yield the same return. Using this strategy month after month until the March options expiration will allow a steady flow of income (assuming the position is not assigned). It is important to monitor this position and purchase back the higher calls on weakness and selling them back out on strength (will return the most profit). It is also necessary to Keep track of the gain/loss, so it is not written too lower for a net loss at expiration. *NOTE*: Writing the higher strike contract out with as many days until expiration and/or waiting to write it out as implied volatility is increasing, are two ways of receiving higher premiums. Gold Option Strategy #2: Open a long vertical call spread on Gold using Leap 2011 options. Purchase the January 2011 60 strike call options. The current cost of opening this would be $3,440 per option contract. I would then choose to write a January 2011 130 strike call option against it. This would lower the cost of the position by 13.1%. 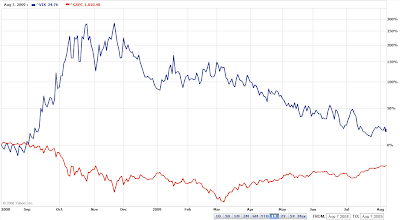 If Gold is at or above 130 per share at the January 2011 options expiration this position would reach its maximum profitability and yield a return of 134.1% per contract, more than doubling the investment. In order to break even from this investment the GLD needs to be at or above 89.90 per share at January 2011 options expiration. This is a very bullish strategy on gold, for a less bullish approach see the next strategy. Gold Option Strategy #3: Open a long vertical call spread on Gold using Leap 2011 options. Purchase the January 2011 50 strike call options and sell the January 2011 90 strike call options against it. This position would cost $3000 per option contract. As long as the GLD is at or above 80 per share at January 2011 options expiration this position will be profitable. The greatest return from opening a position like this would be 33.3%, and that is if the GLD is above 90 per share at January 2011 options expiration. If a short term rise in gold is expected, it may be a good idea to wait for a price spike in gold to write out a higher strike against it. The strategies outlined above are bullish longer term ideas on Gold. Using call options allows you to open positions for much less while receiving the majority of the gain (until delta is 1.00 like in strategy #3, the contract will increase $1 for each $1 increase in share price). However they include the risk of losing more (in terms of %) if the GLD drops below the indicated purchase (lower of the two) strike price. These are just some examples and not recommendations to buy or sell any security; if you're more bullish/bearish, you’ll want to adjust the strike price and expiration accordingly. The reason option volumes have surged in the last 5 years is because they are a great way to hedge your portfolio as well as create income off of your shares (click here to see annual options volume chart). As you can see from the top ten most active option contracts traded, which is posted daily on OptionMaestro.com, Citigroup Inc. (NYSE:C) option contracts seem to be among the most active and near the top everyday; which makes them extremely liquid. Therefore I decided to write about a couple strategies that can be used on Citigroup to create monthly income. In order to use the option strategies outlined below you must be willing to hold Citigroup stock, as if the call options do not get "called out" the stock will be held after expiration, and if the put options get "put to you" the stock will also be held after expiration. This post requires the knowledge of stock options. To learn more about the risks, pricing, calculations, strategies, and options in general click here. With high volatility on the underlying and extremely high implied volatility, the premiums on Citigroup are much higher than your average stock. If we get a short-term stock market correction (with no major news on any particular financial company), Citigroup being up less than 20% compared to the other financial stocks, should not sell off as much. Looking at the Google chart below we can see that Citigroup has been left in the dust compared to Bank of America Corporation (NYSE:BAC), Goldman Sachs, Inc. (NYSE:GS), and JPMorgan Chase & Co. (NYSE:JPM). The stock is within pennies of a strike price, which happens to be the $4 strike (as of Monday's close), which also makes this contract most attractive. Citigroup has spent the majority of the last 6 months between 2.60 and $4 a share (see chart below). We can see that Citigroup has had a very tough time getting through $4 a share, so if it can get above $4 and hold, it will become a serious support for Citigroup. Assuming Citigroup will trade in a tighter range in the months to come, support at $4 would put a nice floor in for the option strategies outlined below, as the 4 strike can be used month after month for generating income. Option Strategy #1: Buy Citigroup stock and sell the August 4 call option. The premium received will protect to the downside by 5.08%, and if the stock is assigned at options expiration this position will yield 6.60% (in 11 calendar days). If this stock sells off by greater than 5.08% by options expiration the position will be down, but Citigroup can be written out again for the September 4 call option lowering the cost on the stock even more. If Citigroup goes up significantly past $4 a share, it may be best to roll the option forward by purchasing back the August 4 call option, and writing a 4 September call option or even the October 5 call option, depending on the price and premium received. Option Strategy #2: Sell the Citigroup August 4 put option. The premium received will allow for a profitable position as long as Citigroup does not close below $3.69 a share at August options expiration. For maximum profit, Citigroup must close at or above $4 a share at expiration, if it does this position will return 5.00%. If Citigroup closes below $3.69 a share at August expiration, again rolling the position on Friday August 21 for the September 4 put option would be a good idea (in my opinion). As of now the top ten most traded option contracts are below (from most traded option contracts to least). 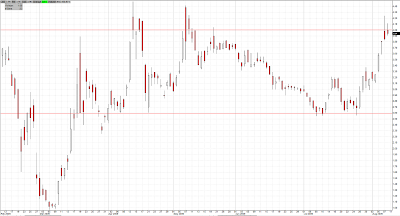 Lately I've been paying a lot of attention to the CBOE Volatility Index (VIX). The VIX traded lower by as much as 6.58% Friday before rebounding slightly and closing down 3.54%. Historically as the market moves lower the VIX moves higher, and vice versa as you can see from the 1 year chart below (click chart to enlarge). I believe the market may be due for a short term sell off as earnings season comes to an end, so one way to hedge your overall portfolio (as well / instead of selling covered calls on stocks like mentioned in Sell Off Ahead? 25 Ways to Profit & Protect from a Stock Market Correction) is to trade options on the VIX. I believe the VIX at 30-35 isn't out of the question, as we all know the U.S. economy just isn't out of the woods yet. If increased levels of uncertainty return back to the market in Q3 or Q4, I expect to see the VIX at 35 or higher. 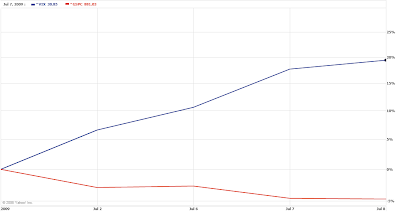 A one week chart of the VIX and S&P, from the early July sell off, is below. As you can see, as the S&P 500 sold off by almost 5%, the Volatility Index spiked by nearly 20%. So in this post I will outline an option strategy that will profit if the market sells off. This post requires the knowledge of stock options. To learn more about the risks, pricing, calculations, strategies, and options in general click here. The reason option volumes have surged in the last 5 years is because they are a great way to hedge your portfolio as well as create income off of your shares. VIX Option Strategy: Opening a diagonal call spread on the VIX. I am opening this position using the December 25 call options on the Volatility Index for my base. The current options market is pricing the December 25 Call on the VIX for $510 per contract. Once I have purchased the 25 calls, I'll wait for a spike in the Volatility Index, and write out a higher strike / closer expiration call option. For example, let's say I purchase the December 25 calls on Monday August 10, 2009 and the VIX spikes to near 27 by Wednesday of the same week. I would most likely choose to write my contracts out for the August 32.50 Strike call option (which are currently trading at a theoretical price of $25 per contract). I assume the contract price would increase to roughly $75 per contract on such an increase. This would lower my cost by almost 15%. If the VIX is above 32.50 at expiration this position would profit 72.4%. If it is not above 32.50 at August expiration, it can be written for the September options expiration. I will continue to do this until I am called out. If the VIX keeps declining and higher strike options are not written, this position will lose 100% of the price paid for the December 25 calls, but again it is a portfolio hedge so it can be seen as a cost of doing business. The periods just before expected economic data, like monthly unemployment numbers, make for a great time to write out the higher strike call options. This is because the Implied Volatility spikes leading up to the data, which results in a higher contract price. After the data is released the implied volatility drops, many times resulting in a decrease in the contract price, even as the VIX increases toward the higher strike price. This is one way to hedge your portfolio and possibly a way to create monthly income depending on where the Volatility Index trades in the months to come. If you are bullish on the market I would look to be purchasing at the money Put options on the Volatility Index, as they are priced very low. This is just an example and not a recommendation to buy or sell any security; if you're more bullish/bearish, you’ll want to adjust the strike price and expiration accordingly.